Have you ever had a meeting with a prospect that didn’t go the way you had hoped? Or worse, you think the meeting went great, but then you never hear from the prospect again or they won’t take your calls? This is a very familiar scenario for government contractors and there are several reasons why this happens. One reason is not having government contract data and market intelligence to properly communicate and position the value you provide. Most government contractors use a bid matching system. 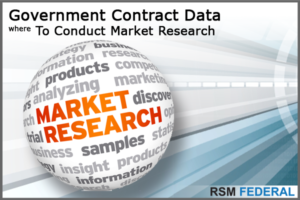 Government contract data increases the chances of winning a contract. I’m amazed at how many companies “wing it” when it comes to prospect meetings. Many government contractors walk into meetings with a plan to deliver their capability statement; talk about their company, products, services; and ask “do you have any contracts we can have?” This is a recipe for disappointment that makes you look and sound like every other contractor. Winning government contracts requires more than FedBizOpps or even the most advanced bid-matching tools. You want to differentiate yourself, your company, and the products or services you provide. It requires that you educate yourself, research the prospect and obtain the right government contract data in order to differentiate. Unlike the commercial market, there are a multitude of online government resources you can use to educate yourself on your prospect before you meet with them. How long will it take? It depends on the volume of information available for your North American Industrial Classification System (NAICS) codes and the type of products / services that you sell. The first tool I suggest you check out is FPDS. The Federal Procurement Data System is the most comprehensive free tool available to government contractors for determining who buys what you sell, how much they buy, and how often they buy it. You can break down buying history by NAICS, product service codes (PSC), place of performance, government agency, department, and hundreds of other data points. Government contract data helps you confirm who you should be targeting. You can also read an article for What is FPDS and 5 Ways it Can Help You Win Government Contracts. However, FPDS is not a user-friendly tool. As a result, the government has another database for government contract data called USASpending.gov. This website is very user-friendly and easier to use than FPDS. In fact, USASpending.gov just underwent a massive upgrade that increased the number of data fields from 180 to 250. The government contract data in USASpending.gov is pulled from FPDS. FPDS is the master system for contract data. Because some contract data is not pulled into USASpending.gov, we show our clients how to use both. FedBizOpps, also known as FBO, is typically the next website I recommend. It’s very easy to search FBO to see if there are open solicitations for your products and services. Most companies think of FBO as solely a tool to find opportunities to bid on. However, FBO is also an excellent tool for market intelligence. For example, instead of focusing on bidding all the opportunities you can find, start documenting the agencies and contracting officers that buy what you well. You may find the same contracting officer and phone number on several of them. That is someone you should target and identify the departments or organizations they serve. While FBO is the largest bid-matching and contract management system, there are several others. If you have a GSA Schedule, you’ll have access to GSA eBuy. But specific agencies may also have their own contract management systems. It’s worth a quick search online to see if the prospect you are targeting has its own acquisition portal. This can be a like searching for state and local contracts. The city or state you live in has its own website for procurements. For example, the intelligence community (CIA, NSA, NRO, NGA, DIA) utilize the Intelligence Community ARC; the US Navy may use NECO; and if you sell products, you definitely want to check if the Defense Logistics Agency (DLA) buys what you sell. DLA procures billions of dollars in products through a system called the Defense Information Bid Board System or DIBBS. Each of these systems can provide extensive government contract data to help you position in the market. Don’t simply look at these “bidding” or “bid matching” systems to find opportunities. You should also use them to research government contract data to help develop your sales strategy. Every prospect you will EVER come into contact with is represented by a Small Business Office. Small business offices for each federal agency are called OSDBUs or Office of Small Disadvantaged Business Utilization. For the Department of Defense, small business offices are called OSBPs or Office of Small Business Programs. It is very easy to find names and phone numbers for these offices. Search online by agency name and “small business office” or visit this website for a list of major agencies and small business liaisons. Small business counselors should be able to tell you who buys what you sell. However, remember that small business offices are a microcosm of society. Some are really good and others provide little to no value. The fastest way to determine if they can help you is to ask them if they work closely with the contracting officers and program managers on solicitations before solicitations are released to the public. By researching government contract data, you can ask small business offices questions on whether or not they know the decision makers. You want to verify if they have any influence over the acquisition process. Small business counselors who work closely with the prospect in pre-acquisition are the ones that are going to know about opportunities before they are released to the public. They will go to bat for you if the prospect tries to make a solicitation full and open as opposed to a small business status you may hold. 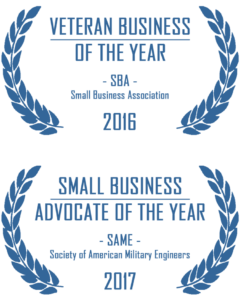 These include small business, minority or socially disadvantaged (8a), woman owned (WOSB), veteran owned (VOSB), service disabled veteran owned (SDVOSB), HUBZone, and several others. When it comes to government contract data and data analytics, bid-matching systems, also known as contract management systems, are sold to government contractors more than any other sales support system. We have other articles on bid-matching systems but several key points. First, you can get bid-matching systems from your local PTAC. However, you don’t have access to the back-end. You only get emails with potential opportunities and you can’t update your search criteria on your own. To update, you have to coordinate with your PTAC counselor. Most other bid matching systems you are able to login and modify your search criteria. There are more than 500 bid matching systems that you can pay for on a monthly or annual basis. They range from $25 a month to more than $12,000 a year. Like anything else, you get what you pay for and a solid solution is somewhere in the middle. I’m often asked, “Why pay for a bid-matching system if they get their data from free government systems like FedBizOpps and DIBBS?” The answer is ease of use. Many of the intermediate to high-end bid matching systems are pulling data, two or three times a day, from between 20 and 100+ different government systems. Can you imagine going to all those sites, every day, trying to find what you need? Ease of use is a very good reason to use a bid matching tool. The second reason is based on how bid matching companies make their money: The user interface and the algorithms they use to crunch the data. I gave a webinar last week on “Who buys what you sell? How much and how often?” I downloaded three years of data from FPDS for marketing and advertising procurements (marketing companies). There were 12,800 contract actions but more than 2.8 million fields of data. Remember, FPDS is only one of the 100+ systems that bid matching systems pull their data from. Can you imagine sifting through 20 million fields of data? With the right algorithms and a system that is highly intuitive and user friendly, you’ll save countless hours every week. Each of those saved hours is money. That’s why companies serious about government sales have a bid matching system. A powerful contract analytics system that provides pin-point intelligence, where and when you need it, will accelerate the front-end of your business development process. Yes. I have a recommendation. The most comprehensive, cost effective, and user-friendly bid matching system on the market that is really good at providing value is Repperio. We’ve already sent an alert to all of our clients and members recommending they take a look at Repperio. Use all of this research to map out a strategy for meeting with government buyers. Map out the questions you want to ask, what questions you should be prepared to answer, your goals and objectives for the meeting, what materials to bring to the meeting, and strategize the possible scenarios. If you’re serious about winning government contracts, we also suggest you take a look at RSM Federal’s Federal Access program. 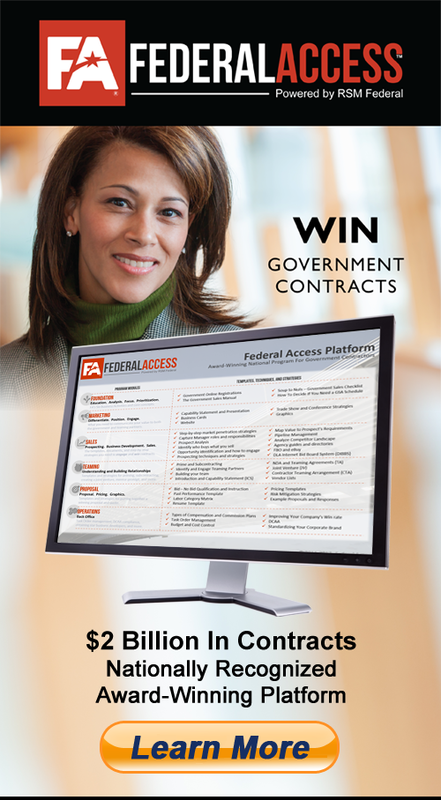 Federal Access is a multi-award winning platform used by more than 1,000 government contractors. With hundreds of resources, it is the most comprehensive platform on the market with every template and step-by-step strategy a company needs to position for and win government contracts. With billions in contract awards, learn more about Federal Access.